Microdata has been around for a few years but it is still greatly underutilized by most ecommerce installations. However, the team here at Six Demon Studio is fairly sure that is going to change in the near future. Before we can discuss the importance of microdata, we first need to understand what microdata is and what its function is. The watered down explanation of what microdata does is fairly simple, it points out information on a web page and tells the search engine what that information is about. This added information allows the search engine to produce a better browsing experience for the user by providing data relevant to their search. For a person it is easy to look at a web page and determine what the information on the page means, but search engines don’t have the ability for critical thinking and they can only catalog the text on a page and not the meaning of that text. For example, when looking at a product on an ecommerce site the user will be able to identify the price, what currency format it is in, what the product is, what the description of the product is, etc. However, the search engine just sees words on a page. Microdata solves that problem by marking pieces of information and telling the search engine “this is product, here is its price, this is the description of the product”. There is a good possibility that you have already seen a site using this functionality and realized it as the functionality is transparent to the end user. There are some design concerns that need address during the design phase of a web project using the functionality and programming tasks that need done. 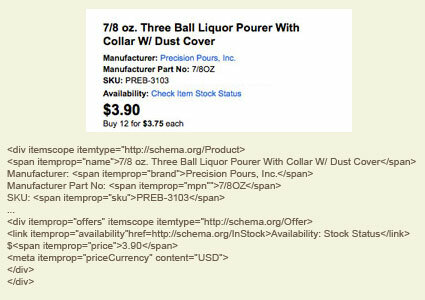 Below is an example of what a user would see versus what a search engine would see on a typical ecommerce product page. When we see the website as the search engine crawler sees it in the above example, the microdata makes it very clear what all of the information that the human users mind automatically knows. Products are not the only type of information that can be marked in the code of a web page for the search engine to catalog. Other information such as postal address, company information, and a range of other topics are all supported by microdata and recognized by the three major search engines. Now that we have a better picture of what microdata does, it is easy to see why it is extremely beneficial to an ecommerce site or any other website that spends time with search engine optimization. Better search results help deliver a better user experience and can lead to higher search engine rankings, both of which will help increase customer conversions. Search engines like Google are constantly refining their search results to provide more accurate results, the better Google understands what information a page is providing, the better it will rank that information. If the competition is already using microdata and your website is not, then you’re behind. However, if your competition hasn’t put this functionality in place, now is the perfect time to look into getting a head start. If you would like to know more about microdata or are interested in discussing what it would take to get the functionality on your website, please feel free to contact Six Demon Studio. Information on how to get in touch with us is available on our contact page.